This is the third book in this wonderful series. The characters in this series are connected to animal spirits. 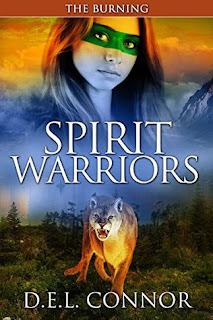 For those who love to read Native American stories, then this is the series for you. These teens have done battle before. They have been fighting the evil spirit of Machayiwiwi, who was at one time a very powerful medicine man. The teens are guided and helped through visions given them by ancient chiefs. This book is full of real life. Each of the teens deal with personal things in their own life. There are so many things happening that any reader will find something t identify with. There are many teens who deal with divorced or alcoholic parents. These teens deal with their feelings of love and jealousy. This author really knows how to keep the story real, but include the elements of magic in just the right does. This book doesn’t have teens just jumping in trying to fight the evil. You see them actually live their life and get involved in things that aren’t always right or best for them. In other words it is todays reality. If you haven’t read the other two books in the series you need to do just that. Make sure you have plenty of tissues handy. The author doesn’t sugar coat her plot. People die and teens must deal with it. Pull up a chair and prepare to read a book you can’t put down. Join Emme, Ollie, Charlie, Bets and their friends for an adventure you won’t soon forget.